Paula Castillo’s visual language includes public interventions, intimate and large-scale sculptural installations, and short films. Her work bridges a quiet division between the desire to dissolve into the world and the need to buttress margins. I create public interventions, intimate and large scale sculptural installations and short films in response to the tensions inherent in the production of ‘place’. Although I am a conceptual and socially engaged artist, I am ultimately a maker. With a straightforward fascination for ideas and objects that grow, transform, and reshape themselves, I create work with a quiet division between the hyper organized desire to dissolve into the world and the need to buttress margins. 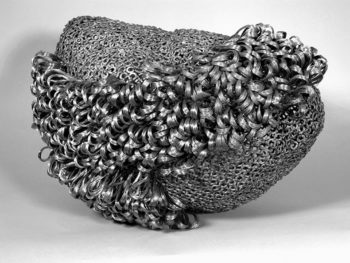 Although I do not maintain an obligation to a single cohesive genre, I have spent most of my practice working with metal. Here I mainly utilize carefully appropriated industrial steel bi-product scavenged from the regional waste stream to ‘show and tell’ a piece of the suffocating dislocation of matter. I arrange and weld these modest forms to mimic the manic intensity with which we structure our world, i.e. the human agency to arrange and work nature/culture. The man-made microcosms combined with the expansive natural environment have been the catalyst for my interest in the systems and spaces we inhabit. My interest is in translating how this intermingling of tradition, colonialism, modernity, American socioeconomics and the increasingly postmodern circumstances of technology saturate and transform the landscape. I will use SPREAD funding to distill the excess of physical objects into something to be contemplated by the larger regional community in which I live. I want to refine an embrace of disorder in developing new possibilities for waste stream material through sculpture that reveals metaphor, intention and meaning, but will also serve as a practical method for reducing erosion, and thermal, sedimentary, and heavy metal pollution of the Rio Grande. I have long been interested in arroyos as political artifacts— most recently in the context of the way their feedback loops intertwine with incarnations of well or badly designed artificial atmospheres. This grant will give me the resources needed to experiment with an idea related to the mechanical potential of storm water in a local arroyo in real time. With this money I will conduct research at local sites with dangerous vortexes of flawed hydrology efforts like the transient homeless site at the Embudo Arroyo neighboring Jefferson St. in NE Albuquerque. With this money I will also rent a crusher to break apart recycled concrete to use as aggregate for new cast concrete sculptures; I will buy a portable electric hydraulic rebar bender to bend 1”rod scavenged from the last Los Alamos Fire; I will take blacksmithing classes to learn how to manipulate this steel into more intuitive and baroque forms; and I will buy the time required to collaborate with hydrology and structural engineers and environmental scientists to create sculpture that exploits both the place making and mechanical potential of storm water in local arroyos. To learn more about Paula Castillo click here.